The miracle of Munich may be over but the spirit shown in Munich must stick around if Arsenal wants to go to the likes of Munich again next year. Munich away was one of the strangest games I have ever been too. 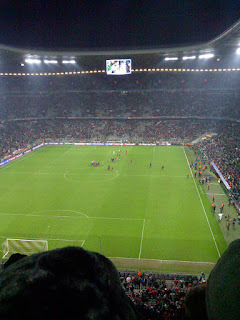 You go to Munich (one of the most in form teams in Europe) and win 0-2 and are still disappointed at the end. If someone had told me that Manuel Neuer would be holding on to the ball in a desperate attempt to time waste in the 85th minute or that Robben would be taking the ball to the corner desperate not to give the ball away then I would have been expecting pigs to start flying. I would say that I am one of the more optimistic supporters but I’m not sure if I believed we could achieve the impossible pre match even though I made the trip to Munich. I think many like me were hopeful but did not expect. Arsenal put in a performance to make every Arsenal supporter proud. The players had the spirit the manager has been talking about and you would think, if that spirit remains, the fight for the top four will get very interesting. Arsenal got off to the best possible start and even though it was not Theo Walcott’s best ever game, he managed to get into a dangerous position and create a goal. Giroud got himself in the correct position and a position he must get himself in more – I feel for Giroud because I think he puts in a shift (perhaps he could have put himself about a bit more at the lane though). I hope we add a striker in the summer but keep Giroud in the squad because he offers us something a bit different and does have 15 goals and 10 assists this season after all. Laurent Koscielny was back in the side and scored the second and always is a threat from set pieces. I called for him to start more a few weeks ago and get a run of games together because I genuinely believe he is our best centre back when playing regularly and has a massive part to play in the remaining games. It was a massive decision to ‘rest’ our captain and our goal keeper but it paid off as Koscielny and Fabianski both were outstanding and should keep their place at Swansea. Swansea away is massive but the victory in Munich should give some much needed confidence. Arsenal lost to Bayern Munich on AWAY GOALS, Bayern Munich did not score more then Arsenal over the two legs but went through because of where they scored their goals. Arsenal can take a lot from the tie and must believe they can do it. Arsenal in my opinion have massively under achieved this year – they have good players; in Wilshere (when he is back), Walcott, Cazorla etc we have the talent and ability to get us into Europe but they must believe. Win at Swansea and get on a winning run and it is more then possible – confidence brings wins BUT the only way to keep confidence is to keep winning. Munich may have been seen as impossible but getting in the top four is not impossible. Trust me.